St. Andrew's is Oakville’s oldest standing Catholic Church. Built in 1840 to service the Irish-Catholic dock workers, the church has grown and developed down through the years. Church population has increased and the building itself was recently enlarged and completely renovated, in keeping with its historical character. 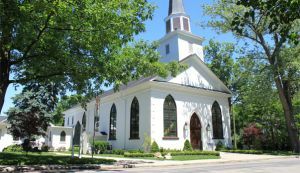 It is known as "the white church” and it is the crowning jewel of Oakville’s historical district. If you are visiting St. Andrew Church website for the first time, it will provide you with information about our church, our ministries, sacraments, and our staff. Our mission at St. Andrew is to be apostles of Jesus Christ, to celebrate the sacraments and proclaim the word of God, to give witness to our faith in our daily life, and to share our talents in building a Catholic community of love. We welcome you and invite you to share in the spiritual and social activities of our parish.